When you finally decide to move to another home, there are a few things you need to accomplish when you settle in. 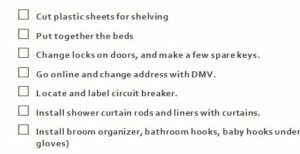 The free “First Things to Do after Moving” sheet is here to help you get everything ready when you arrive in your new home. There are a number of items that people overlook when they move. You forget these items until you actually need them. This template gives you the power to organize your move and transition to your new living space with ease. Take a look at all the examples given and make your own additions before you print this sheet and get ready for the big move. To learn how to use and download the First Things to Do after Moving for yourself, just follow the guide below. Click the link below to download the free template document to your computer. Read through the list of items when you first arrive in the home. As you complete items on this list, you can check them off with the boxes to the left. If you feel like the list is lacking some items that would benefit you personally, you can always add these to the list. To add something, click the end of the last sentence and press the “Enter” button. This will select the next line down and create a new checkbox. All that’s left to do is write a new item on the line you just created. This template makes the moving process much easier. Try the template today by following the link below.